Mawbima Lanka: Pen mightier than sword? 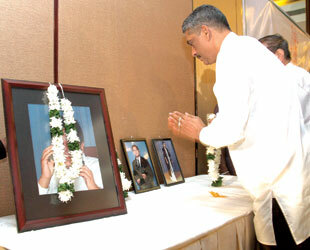 General Sarath Fonseka (Retd,) on Friday garlanded a photograph of slain newspaper editor Lasantha Wickremetunge, and paid his respects (above). He was addressing lawyers of the National Lawyers Association as common candidate of the opposition, along with UNP leader Ranil Wickremesinghe. Late Wickremetunge was also a lawyer, and the National Lawyers Association was honouring members who died this year.